K.C. Conway, CRE, is a Sr. VP - Credit Risk Management, with responsibilities for REVAL (Real Estate Valuation and Environmental Services) and Market Intelligence. He has 30 years experience as an appraiser, underwriter, lender, credit officer and economist. Noteworthy recent roles prior to joining SunTrust Bank include: i) Chief Economist for Colliers | U.S. (2010-2014); ii) Commercial Real Estate Risk Specialty Officer — NY Federal Reserve Bank (2009-2010); iii) Commercial Real Estate Subject Matter Expert — Atlanta FED (2005-2009); iv) and Director of Underwriting — legacy SouthTrust Bank (1995-2005). Mr. Conway is also a frequent lecturer and speaker on commercial real estate markets and valuation matters for government agencies, financial institutions, and private industry groups. Over the past 5 years he has addressed approximately 350 real estate industry conferences, including the Appraisal Institute, American Property Tax Council, The Counselors of Real Estate, FDIC, FFIEC, IPT, NAHB, National Association of Realtors, NAIOP, SIOR, Society of CPAs and ULI. Disruptive technologies that are effectively reducing demand for labor. In essence, these technologies are fueling isolation behaviors that underlie Brexit, anti-TPP sentiment and anti-immigration policies across Europe, North America and Latin America. Left unaddressed, more volatility and conflict is ahead that serves to only inhibit economic and GDP growth for all. Neither of the aforementioned are easy challenges to tackle, yet alone solve. We can’t put the genie back in the bottle in terms of global interconnectivity or advancing disruptive technologies such as robotics, 3-D Print manufacturing and driverless vehicles. 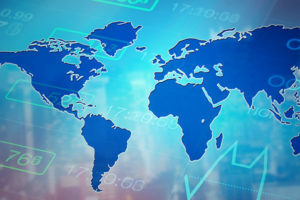 Today’s global economy is at an inflection point not dissimilar to that experienced at the onset of the industrial age or end of World War II requiring massive reconstruction in Europe to rebuild a sustainable peace. The question that needs to be answered in advance of another period of isolationism that will inevitably lead to another world war type conflict is: How do nations collaborate and reconstruct a new model that promotes growth beyond today’s narrow band of industrialized nations? In essence, what is the modern-day Marshall Plan (European Recovery Plan) for a 21st Century Disruptive Technologies era (think of it as an “Emerging Markets Economic Participation Plan”)? Let’s first put in perspective the disparity in global economic growth. In Table 1 from tradingeconomics.com (one of my top five recommended economic sources) highlights the economic disparity. Banking — not just the dominant U.S. and European ones but the World Bank as well. This control of so many of the ingredients that determine the economic pie by a few is a recipe for conflict and economic instability. And that is what we are seeing play out in response throughout Asia, the Middle East, and Europe. Leadership is lacking on the global stage. Brexit was a wake-up call this past Summer. And now the UK “Supreme Court” has ruled that the UK cannot proceed with initiating the people’s desire to divorce from the European Union until Parliament approves the decision. I kid you not. Refer to the following coverage of the UK court ruling during the first week of November 2016. Could this be fortuitous to future U.S. Supreme court rulings on matters of trade, post new judicial appointments in 2017 under a new U.S. President? Are we on the verge of a new era of isolation? The 2016 U.S. Presidential campaign has also served as an eye-opener for the isolation thinking and anti-trade sentiment from the middle-class that blame trade agreements like NAFTA, versus disruptive technologies in manufacturing resulting in most of the middle-class job loss in the U.S. A redo of NAFTA or TPP won’t bring those jobs back. The robots have them now. The World Bank and post WWII reconstruction structures/organizations have served their purpose and need to be rethought to address the need for a new type of Marshall Plan — an “Emerging Markets Participation Plan.” The World Bank has morphed from a single-institution entity post the end of WWII with a single mission to reconstruct Europe to a bureaucratic 189-member institution with a primary focus to eradicate poverty. This mission, while laudable, looks, feels and sounds like “wealth redistribution” to industrialized nations like the U.S. Import/Export Banks is undermined by currency manipulation and monetary hanky-panky that originated with the U.S. Federal Reserve long before China learned the behavior. When one nation’s currency sets the price of the world’s most needed commodities (oil to soybeans), emerging markets don’t stand a fighting chance when that nation wants to advance its economic growth at the expense of other nations. The ZIRPTI by the U.S. Federal Reserve, in response to the 2009 Financial Crisis, has been exported to Europe and Asia — and now we face a race to currency devaluation without understanding the unintended economic consequences. The U.S. Dollar as the world’s reserve currency is at real risk from cryptocurrency. The U.S. and EU monetary policy behavior is driving global interest in a substitute reserve currency and cryptocurrencies like Bitcoin and BitMint. What are the implications for commodity prices like oil and agriculture that are principally priced using the U.S. Dollar? Don’t be so quick to dismiss the cryptocurrency movement by the emerging market economies. Cryptocurrency is viewed as a way to neutralize currency manipulation and disruptive monetary policy by the U.S. and EU. The emerging markets will use cryptocurrency technology to displace a single-country reserve currency (the U.S. Dollar) in the next decade. A review of the top-trending cryptocurrency news stories as of the first week of November 2016 revealed that even the UK bank regulator is studying the implications. The top five cryptocurrencies in circulation today represent a market capitalization that has grown to approximately $12.2 trillion U.S. Dollars — or 2/3 of U.S. annual GDP. Cryptocurrencies are no longer eclectic or theoretical. They are real and increasingly utilized by emerging economies to conduct trade due to their trade imbalances with the U.S. and Europe. Trade deficits could be eradicated by global use of cryptocurrency. Then what influence will central banks have on economic activity? Any doubt remaining that these two primary problems are not going to be easily resolved? With challenge #1 in perspective, let’s turn to the second big global economic challenge: Disruptive Technologies. Disruptive Technology: The dirty little secret and dialogue that politicians don’t want to have with manufacturing and middle-class labor is that automation, robotics and technology are eliminating labor across all industries and countries — and at a pace that surpasses job loss from any legacy trade agreement. White-collar employment in architectural design, engineering, financial services, legal and medical industries are all under siege as much as manufacturing and transportation industries experienced in the 1970s, 1980s and 1990s, but this time from technological advances that can perform analytical, design, and even diagnostic functions cheaper, faster and more consistently than human labor. As industry faces skilled labor shortages, rising wage pressures, and the need to pay for double-digit increases in costs like medical care, employers are turning to technology to solve the problem. Banks are adopting mobile device technology to replace the teller function and traditional branch banks. Government agencies are deploying self-service kiosks to enhance customer service and improve efficiency. Healthcare and retail are adopting the kiosk technology to control costs and enhance delivery of services. It’s not just ATMs, automated parking attendants or vending services dominating the kiosk revolution. Kiosk Marketplace reports on the growth of the kiosk industry, and projects more than 10.9 percent annual growth of kiosk delivered services between 2016 and 2024.1 It reported in October of 2016 that retail and healthcare are the two major kiosk applications in North America, with retail emerging as the dominant and the fastest growing sector.2 Within retail, the use of kiosks for bill payment emerged as the largest sub-segment in 2015 (in other words elimination of the checkout labor that used to employ students, part-time laborers and lesser skilled workers). And within healthcare, the use of kiosks for hospital information is displacing the front office clerical staff in hospitals and doctors’ offices. So what is to become of this displaced labor? And the challenges just get greater when one starts to layer in 3-D print manufacturing, logistics technology that is remaking the supply chain and need for warehouse workers who are being replaced by robotic forklifts and automated conveyor systems to read, handle and direct packages from shipping container to delivery truck. And what about driverless vehicle technology that is already in testing by retailers such as Wal-Mart or shipping companies testing drone shipping vessels being developed by Rolls Royce?